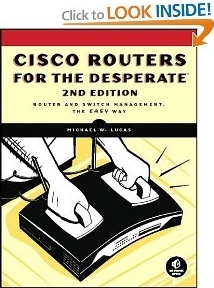 Matt Olander of San Jose, CA says, "A MUST have book for when you need to make a quick change on a cisco router and don't have time to review. This book walks you through from logging in to making your router changes right from the beginning of the book. The title perfectly described my state of mind when I bought it! After 15 minutes or so though, the network was purring along again."